Toyota has just unveiled its brand new GT86 "Yellow Limited." 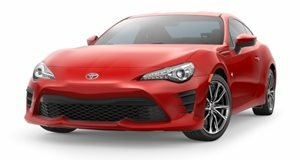 The GT86, as we all know, is sold as the Scion FR-S in North America. This particular GT86 features an awesome Sunrise Yellow paint color and other additional body add-ons. We dig it. The only thing is, if you live anywhere but Japan you will never get to own this car. That’s because it's for the Japanese domestic market, and no FR-S version appears to be coming. But don’t be too sad about missing out here because, once again, Toyota has left something out. You've probably guessed it: the 2.0-liter Boxer four remains untouched at 200 hp. The only difference between this GT86 and the Scion FR-S is the yellow paint and some "aero package" options. In addition to that exterior paint, the black leather interior is also lined with yellow stitching. The coupe will be available with two different "aero packages." The first package, the “Yellow Limited Aero Package”, comes with 18 inch BBS forged aluminum wheels, high performance brake pads and Bridgestone POTENZA S001 tires. The second package, the "Yellow Limited Aero Package FT", includes everything available in the first plus a sweet body kit complete with side skirts, front and rear lips and a big rear spoiler. Of course it starts with a more powerful engine.